The Imitation Game saw the opening of this year’s London Film Festival. Set during the Second World War, but not on any battlefields, this film follows Alan Turing breaking the code of the Nazis' secret communication system Enigma. He was the man who invented the forerunner of modern day computers. He was also an awkward loner who had trouble building relationships with people, a brilliant mathematician and gay, which in those days was a mortal sin. He was portrayed brilliantly by Brit actor Benedict Cumberbatch, who even happens to share a common ancestor with the real Alan Turing. My verdict: Clearly the best biopic of 2014! Because of the huge success of this book, this was probably the most hotly anticipated film of the year. And it’s still going strong. I didn’t read the book and didn’t want to hear from anyone how the film ends. What I heard was that the ending apparently differs from the book. So I went in with an open‐mind, was quite shocked but at the same time really entertained. It’s cool to watch a thriller where you don’t know who the killer is and how it ends. My verdict: Best thriller of 2014. I like watching foreign language films in general, so listening to Swedish in this one and elephants called Sonja was an experience to enjoy for itself. In addition, the story was extremely funny as well, even though it sometimes literally went to the extremes of really dark humour. My verdict: The best non‐English film and one of the best comedies in 2014! I saw this one straight after Germany had beaten France in the quarter finals of 2014’s Worldcup, so naturally I was in a super good mood already. My French, Italian and English cinema colleagues had a good laugh too though. It’s what this film does. It just carried us off to the beautiful beaches of Puglia in Southern Italy, a funny story and a lot of signing to the best of what the 1980’s had to offer. My verdict: Slightly over the top, but nevertheless THE feel‐good musical of 2014! Although set in loud India, this is a quiet story about a housewife and a office worker. The lunchbox the housewife sends to her cheating husband every day accidentally gets delivered to another office worker nearing retirement. The said office worker and the bored housewife then exchange letters by means of the lunchbox. Very well made, slow paced, but with a lot of subtle humour. The best humour bit is the housewife talks to her “Auntie”, who lives in the flat upstairs and always gives plenty of helpful advice. However, "Auntie" never shows her face throughout the entire film. My verdict: Best Indie Drama to take place in India! The story of this WW2 drama was sad, but good. After all, it’s a story about friendship and also incredible sacrifice. What I found slightly irritating is listening to English, American and French‐Canadian actors (the latter being the girl Lisel) so obviously faking German accents. But maybe that’s just me because I obviously hear it. Nevertheless, the performances were good, especially by Ben Schnetzer, who I almost didn’t recognize when I saw him later in the year with a few pounds more in Pride and The Riot Club. My verdict: After Fury, The Imitation Game and Monuments Man, the fourth best WW2 drama of 2014! In this drama about a heterosexual cowboy discovering he has aids in 1985, the performances of both Matthew McConaughey and Jared Leto were absolutely brilliant and well worth their Academy Awards. So was the great story about tolerance and human compassion. My verdict: Simply the best drama of 2014! Whereas Fury and The Imitation Game can be seen as anti‐war films, the true life biopic of Jordan Belfort felt like an anti‐drug one. Swearing, defrauding and partying his way to the top of New York’s Wall Street in the booming 1990’s, Leonardo DiCaprio delivered another amazing acting performance. I enjoyed seeing him in the, at times, totally ridiculous, Nineties outfits. Jonah Hill was great too: often playing scenes which even let the audience feel ashamed and embarrassed in his place. After all these drug odysseys, I was actually a bit surprised to read that Jordan Belfort is still alive and kicking. My verdict: A good way to learn that too much money can do more harm than good. I expected lots of bang, boom bang action and little interpersonal communication. So Fury really did surprise me. Showing the ugliest side of war, but on a personal level, it was very emotional and touching throughout. It didn’t just glorify American patriotism, but hinted at the fact that the Germans were human beings, too. That and Brad Pitts effort to speak German really impressed me. It also made Fury a true anti‐war film exposing the pointlessness of any war. My verdict: The best anti‐war of 2014! We have had this film on at Odeon West End for a long time and so I watched it several times. I had never heard about the Jersey Boys, Frankie Valli or the Four Seasons before, but after I saw this film, I became a fan. Jersey Boys can’t be classified as a true musical film because there was much more speaking than singing. Some songs were only played in the background or over scenes. Other songs were started, but not sung to the end. Nevertheless, a well‐done biopic that follows the band members all through the 1950’s to the 1990’s. My verdict: The best music‐based biopic of 2014! I rather stumbled across this not so well known off‐mainstream film by chance at a time I still got cinema tickets for free. But afterwards, I was pretty impressed. The story about a young boy who has memories about leaving his body during surgery really gets you thinking – whether you believe in an afterlife or not. 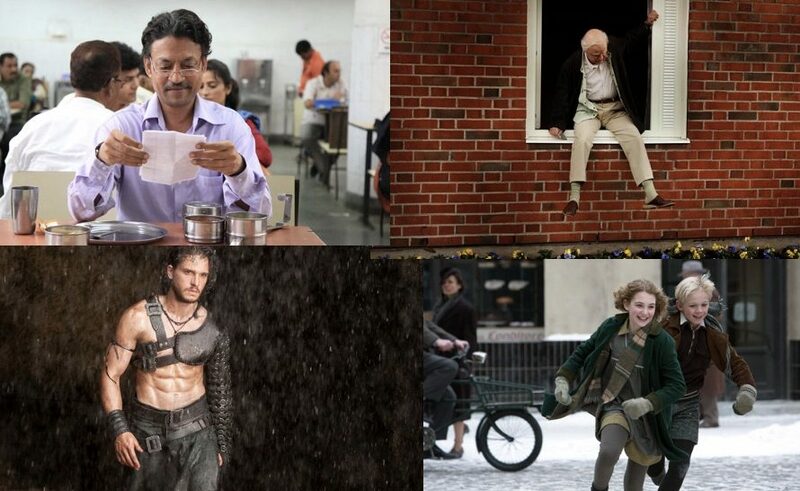 My verdict: The film of 2014 that delivered most food for thought! I have been fascinated with the story surrounding the outbreak of Mount Vesuvius in 79 AD for a long time. Even more so since I visited the actual site in Southern Italy in the summer of 2013 (and enjoyed the most hilarious tour ever thanks to tour guide Francesco!). The film was well‐done and the 3D effects pretty astonishing. Even though the story reminded me a lot of Titanic (unfulfilled love between a gladiator and a noble woman, disturbed by a general hoping to marry said noble woman, then the catastrophe, the lovers trying to escape together etc.. etc). But with a slightly different ending. See for yourself! My verdict: The best adventure / romance 3D drama of the year! With 163 minutes, this is probably the longest indie drama I ever watched. But time still flew by. I found it fascinating to see real people play the same characters over a filming period of 12 years. This is totally unique, I have never seen anything like it before. The music played in the background always reminded me of my own youth and where I was at the time the songs were playing on the radio or later on watched as a video or on an ipad! Amazing! My verdict: A truly authentic film gem to the smallest detail. Steve McQueen’s masterpiece surrounding the incredible real story of the free man, then slave, then freed again Solomon Northup was released in UK cinemas at the very beginning of 2014. And went on to collect three Oscars plus various other awards. The acting and the music are amazing. Plus, even though it’s a sad story, the imagery still provides the viewer with truly beautiful surroundings to delight in. My verdict: The winner of 2014 in every category! Over to you: What was your favourite film of 2014? Let me know in the comments!